You are purchasing a $50.00 gift card to Marion Ponderosa Steakhouse at 2227 Marion Mt. Gilead Rd. in Marion for only $25.00. Welcome to Ponderosa Country. Where today’s families find the spirit of the Old West, the flavors they crave, and something-for-everyone variety. 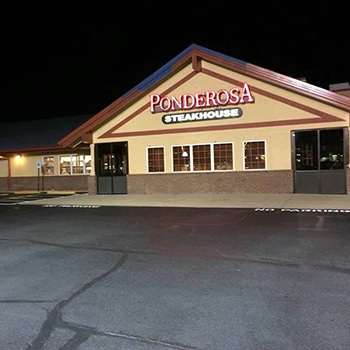 Ponderosa Steakhouses serve great steaks, seafood and sides along with an expansive Buffet featuring a variety of dishes including Fresh Vegetables and Fruit, Soups, Salads, Appetizers and Desserts. And a variety of Beef, Chicken, Seafood and Pasta offerings. When it comes to friendly atmosphere, our staff offers full-service at your table and a help-yourself Buffet. 2227 Marion Mt. Gilead Rd.